Dereck Gillett stands out at sporting events in his 1A/8-Man High School of Rock Hills in Mankato, Kansas, population 808 located in North Central Kansas. Whether it’s his 6-foot-4, 195-pound muscular size or his 39-inch vertical, Gillett looks the part. 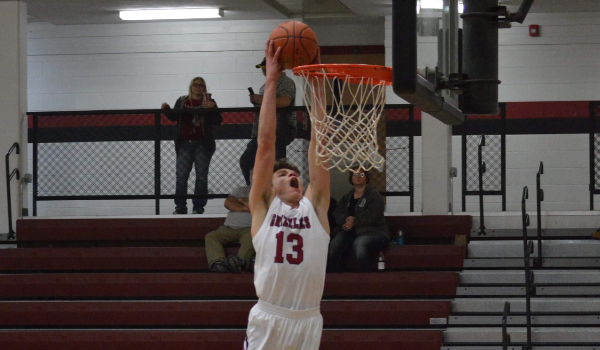 Gillett has been a highlight reel this basketball season with 21 dunks so far in 2018-2019, not something you see all the time in 1A basketball. It seems like we have a dunk submission at Sports in Kansas of his every single night they have a game. However, people are often fooled into thinking there are only big time plays at 6A high schools, which is so far from the truth. In fact, this year we have a hand full of dunk submissions from 1A on just about every night of basketball action. We have certainly seen the highlights of Thomas Atkins of Hanover (2019) or Gilbert Peters of South Gray (2018) over the last couple of seasons. There is talent in every class of Kansas and Gillett is one of those talented multiple sport athletes in the state of Kansas. You may not know much of him in football as he was hampered by an injury as the Grizzlies quarterback as he played in just five games after a solid junior year in 2017. In basketball, as the only returning starter off a 17-4 team he has the Grizzlies to an 8-8 record. Gillett was one of the more underrated recruits in Kansas this fall due to being limited to games because of injury and how hard it is to gain exposure from the 8-man ranks. Gillett has averaged 17.2 points per game, 12 rebounds, two assists, three steals and three blocks per game as a senior, one of the most complete small school stat lines in the state. Not only was he the only returning starter, he was the only returning player with varsity experience and feels like the teams coming together at the right time. We caught up with the senior below who also boasts a 3.75 GPA. I was introduced to basketball from a very young age. I come from a family of basketball players and sports fanatics so I was basically born with a ball in hand. I started playing organized basketball when I was 5 and have loved it ever since. My goal is to lead our young team to be the best we can be. I am not only the only returning starter, but I am the only returning player with any varsity experience. We have a lot of good young talent, the key to our season is for myself to lead our inexperienced players and help them become the players they can be. I still believe we do, we are starting to figure out how to play together. Once we discover how to play as a team the sky is the limit with us. My athleticism and my aggressiveness I believe are my best attributes as a basketball player. My love for playing defense is also one of my best attributes, I love shutting people down. There is nothing like locking someone up or pinning someone’s layup on the backboard. .
We have a really supportive community that loves to come watch us play. We play a fast paced, hard nosed defense kind of game. We attack on the defensive end and create lots of fast break opportunities. We play with passion and love to compete in front of a big crowd. My strengths as a player are my athleticism, aggression, and love for defense. My weakness are definitely my basketball skills. My dribbling and 3 point shooting needs work to play at the next level. We have many good young players on our team. Junior guard Noah Williams has been really good for us. Sophomores Davion McDonald, Jerrod Gillett, and Mason Higer have all started this year. They have added a 3 point threat to our team. Junior center Cheyenne Mohler has improved tremendously since last year. He has been big for us this year. My favorite part about basketball would be the team aspect of the game. When your team starts to click and works together the feeling is priceless, feeling that your team is gelling together and everyone is making big plays while the gym is going crazy are my favorite moments. I was our starting QB and Safety in football, I love football. I love playing for Coach Mizner. He pushes us every day to be the best players we can be. Our practices are always intense are productive. Our assistant coaches are also great. Coach Jones and Coach Spiegel both have great knowledge of the game and are very good players. I truly believe we have the best coaching staff in the NPL. As a team we played in a summer basketball league based out of Clay Center. I also played on SSA Elite this summer. Playing AAU really opened my eyes to see what I needed to work on as a player. I haven’t had too much interest for basketball, I had an offer from Bethel for basketball. I have signed to play football at Benedictine. I plan on majoring in Strength and Conditioning. Hanging with the Catalina Boys. I see myself working as either a Strength and Conditioning Coach or as a Physical Therapist. My favorite subject in school is science. I spend a lot of time on my studies. My calmative GPA is 3.75. Sweden Creme, it’s a small restaurant in Mankato along Highway 36. It’s really good, I always get their double cheeseburger. One thing people may not know about me is how much I enjoy working out. I love getting in the weight room and improving my strength or going out on the field and working on ladder drills. I love seeing the progress.